Allow me to begin by saying that we residents of the Great Plains are hardy stock. We have been through tornado and other weather watches and warnings a million times. Perhaps because this is the 25th anniversary of the F-5 Andover tornado, people are a bit spooked and that is understandable. Still, pay attention to the watches and warnings. Follow the safety rules posted below and we'll be fine. There is one other concern that I only briefly mentioned and that is flash flooding. Some of the storms, especially in Kansas, are going to cause torrential rains. Please keep that in mind and see below. Here their tornado forecast for this afternoon into tonight. 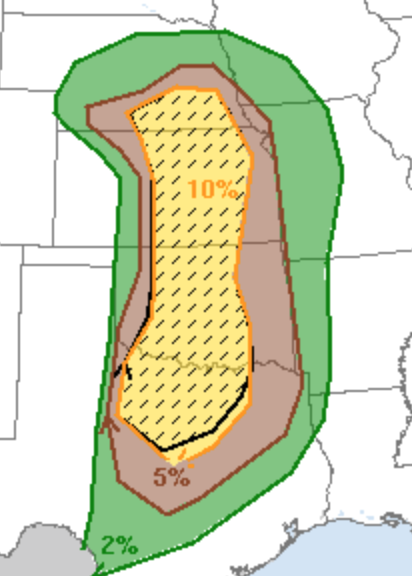 The significant threshold is 5% and hatching means strong tornadoes are possible. While I don't disagree with the forecast, I can try to sharpen it a bit (I hope). Here is the weather satellite for 12:10pm and I've added some of the weather features. From now until about 5pm, the "premature storms" in Oklahoma may tend to suppress any tornadoes there. After that, they are possible. In Kansas, the area near the cold front and just ahead of the dry line is an area where a tornado or two could form. 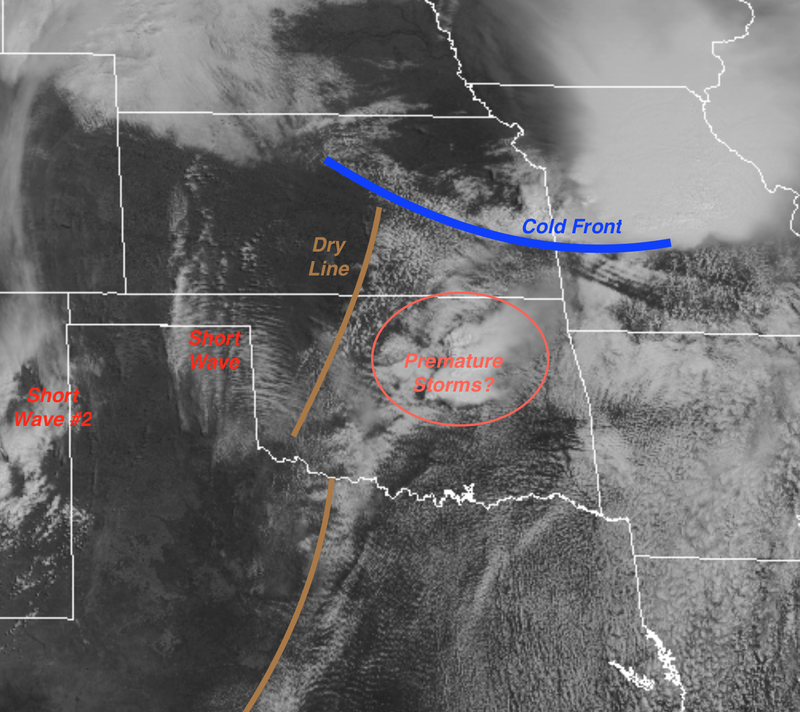 As the short wave intersects the dry line, thunderstorms will develop very quickly. Farther south, in Texas, the second dry line poses a tornado, large hail and damaging wind threat to the entire Metroplex region especially as short wave #2, now over New Mexico, approaches. I am also worried about flash flooding in northeast Kansas after heavy rains this morning. I'll try to update later this afternoon. heroic. I have little doubt that during the worst hours of the storms, they saved people's lives. Robert, I don't know if you were responsible for the VHS video "The Deadliest Storm" that came out from KSN in 1991, but I have uploaded it to youtube since its long out of print. Agreed. The best weatherman I've ever heard!